This is where you can read how to get started with everything. For getting started with Music, check this article and for frequently asked questions, check this one. Getting Vexera running on your server is pretty easy. First, check if you have either the Administrator or the Manage Server permission. Server owners have all permissions even without roles. If you have one or both of those permissions, you can use this link to invite Vexera. As a Pro user, you can also invite Vexera Pro to your server by using this link. Don’t know what being a Pro user is? Get to know it here. Make sure you are logged onto the right account in Discord to be able to authenticate. 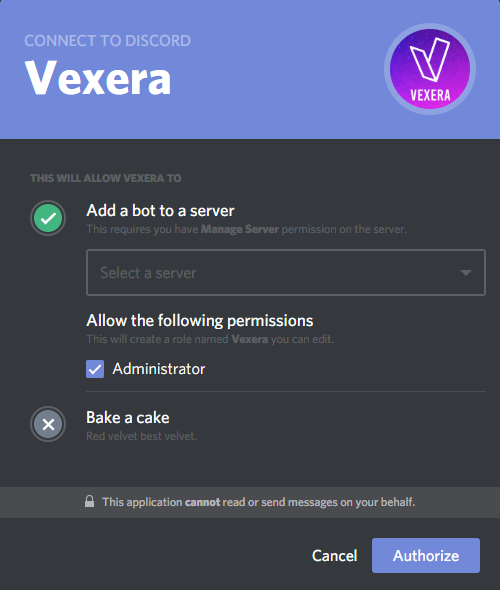 There, just grant Vexera the Administrator permission, choose a server and invite Vexera to your server. but try not to play around with Vexera’s permissions if you don’t know what you are doing. You can find more information about Discord’s permission system here. You can get a list of commands either in the documentation (here) or by using +help. To get some more info about a command use +help [Command] or check the documenation for an extended description of every command.